Whether you want to play by the pool, have fun on the beaches, or explore a new town, California offers an impressive range of vacation ideas. Popular family-friendly destinations include Laguna Beach, Carlsbad, San Diego and San Francisco. Plan your California vacation and visit museums, have fun at a theme park or go on an adventure while staying at one of the best family resorts. Browse Northern and Southern California vacation ideas. Miramonte Resort & Spa is a Tuscan-style getaway, located in the desert town of Indian Wells, near Palm Springs in Southern California. Miramonte features a spa, beautiful gardens and two outdoor pools with hot tubs and cabanas. The resort has 215 guestrooms and suites situated in 14 Tuscan-style villas on 11 resort acres, surrounded by hotel gardens and the pool. If you are looking for luxury California vacations, this is a beautiful place to stay. Natural water wells in the Palm Springs area have attracted travelers seeking rejuvenation to the California desert for generations. Play golf on nearby championship golf courses, visit the Indian Wells Tennis Garden, work out in the 24-hour fitness center at the resort, or go horseback riding, hot air ballooning and bicycling. There is also excellent shopping in Indian Wells or in Palm Springs. 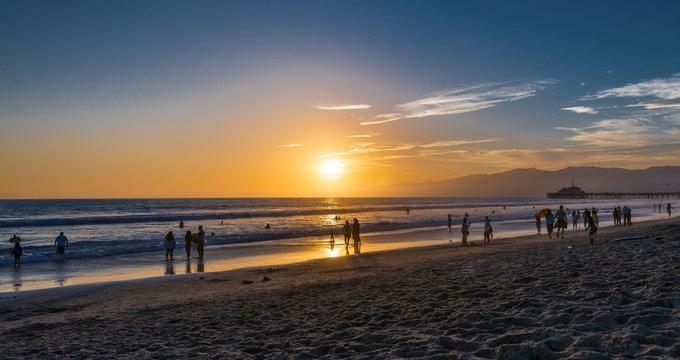 Plan your California trip with doubles from $188, depending on the season. 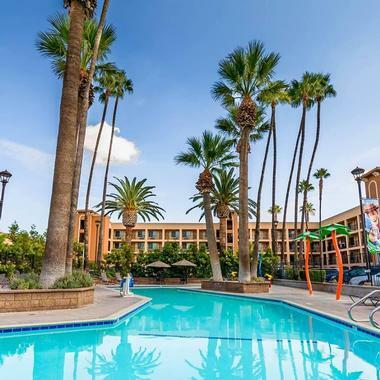 Grand Legacy at the Park is a lively and luxurious family-friendly hotel located across the street from Anaheim's Disneyland Resort theme park, in operation for more than four decades. The resort allows guests to purchase single-day and Park Hopper tickets for both the Disneyland and Disney California Adventure theme parks, skipping the hassle of park lines in favor of the hotel's friendly customer service team. Guest rooms and suites offer amenities such as microwaves, mini-fridges, coffeemakers, and free wireless internet, with 24-hour laundry and dry cleaning services available. Other guest amenities include a heated pool, a children's Splash Zone, and the FIFTH, the only rooftop restaurant and bar in Anaheim. 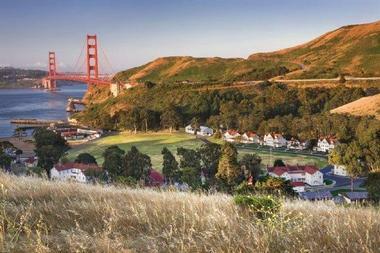 Cavallo Point is a family-friendly getaway with a perfect view of The Golden Gate Bridge, CA. The hotel rooms and guest suites are located in two-story buildings that are environmentally sensitive and have green architecture, a gas fireplace, radiant heat floors, bamboo furniture and panoramic floor-to-celling windows. All rooms also have a private entrance and some rooms have patios or decks. The 578-square-food Contemporary King Suite and the 478-square foot Contemporary Deluxe King offers views of the San Francisco Bay and the Golden Gate Bridge. If you are looking for Northern California family vacations, the Contemporary Two Queens room is ideal for families or groups of friends. Get a signature massage or facial at the Healing Arts Center and Spa, which offers acupuncture, clinical massage, hypnotherapy, energy work and nutrition based healing. Take a hands-on or demonstrational cooking class at the 1,200-square-foot Cavallo Point Cooking School. Overlooking San Francisco Bay, California, like a grand old dame, Claremont Club & Spa reflects stylish grace and old-world charm. Colonial architecture, beautiful interiors and exquisite gardens echo the golden age of America’s Gold Rush and will take you on a luxurious sojourn back in time. This family-friendly hotel has three outdoor pools, over 60 fitness classes, a spa and Kids Club. 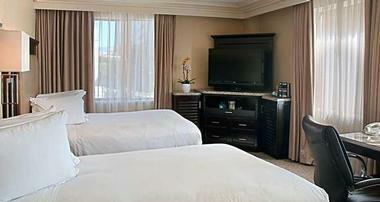 Guest rooms and suites feature elegant décor, spacious en-suite bathrooms and stunning views of the bay. Unwind at the award-winning spa and salon, where you can treat your body to luxurious rejuvenation and relaxation on a truly royal scale. Savor California cuisine and delicious cocktails at Limewood, Claremont’s award-winning restaurant, serving lunch, dinner and weekend brunch amid stunning Bay views. If you are looking for easy vacations with toddlers, rooms at this luxury resort start at $177 per night. Hilton Checkers in Downtown Los Angeles, California, has a stylish rooftop pool where you can relax and enjoy the view of the LA skyline. The hotel dates back to the 1920s with many of its historic features preserved. The original hotel building houses 12 stories of luxurious rooms and suites. The hotel is located in the city's business and financial districts and within walking distance of the theater and shopping in LA. Local attractions include LA Live, the Music Center and The Staples Center. Checkers Spa is located at the very top of the hotel. Checker's Downtown restaurant serves California cuisine with French and Asian influences. Outdoor patio seating is perfect for an intimate meal or a cocktail. The private dining can accommodate up to 16 people. The Hilton Checkers hotel is located near the Convention Center and Staples Center. Rooms start from $150 per night. El Capitan Canyon provides an easy way for families to experience nature in upscale cabins surrounded by a beautiful forest. This getaway is only a two-hour drive from Los Angeles. Cabins and tents are surrounded by 3,500 acres of hiking trails and a state beach. During the summer months, try ocean kayaking or take a surfing lesson. All cabins have outdoor picnic table, wireless Internet access and direct dial telephones in case you need to keep in touch with your boss while on vacation. Upgrades such as fireplaces, Jacuzzi tubs and sleeping lofts are also available. If you are looking for inexpensive kid friendly vacations, cabin rates start at $225 in the summer, and tents are $145. The Philo Apple Farm is perfect for a relaxing getaway for those who want to connect with nature, pick fresh apples, and enjoy home-cooked meals. You can select between Stay & Cook rates and Just Stay rates, with the first one including three hands-on meals with wine, instruction, and recipes. There are four guest cottages to select from, with the original one being located above the dining room and providing gorgeous views of the orchards, gardens, and hills. Every guest cottage features a comfortable queen-sized bed, a large bathroom, and its own porch, but modern technology is limited as the farm is designed to take you away from everything so that you can connect with nature. You can buy snacks or food to take home at the Farm Stand or take a stroll through the orchard where there are 1,700 trees. The dining room located in the main building is where you can enjoy breakfast and those who select Stay & Cook will get to prepare their own meals. Weekend rates start at $275 per night, with a two-night minimum. Although the getaway is not cheap, midweek rates are $225 per night. Furnace Creek Inn & Ranch Resort provides a great starting point for exploring Death Valley National Park. Families can choose from activities such as tennis, horseback riding, horse-drawn carriage rides, golf and spa treatments. There is a children's playground and spring-fed swimming pools. 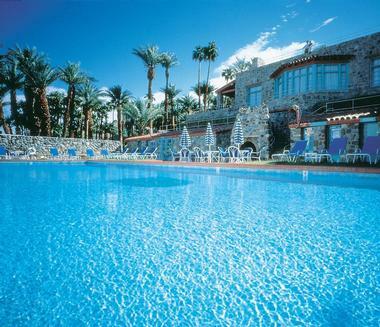 The 224 room Furnace Creek Ranch is usually a better option for families than the historic 66 room Furnace Creek Inn. Deluxe rooms at Furnace Creek Ranch have small patios or balconies. Deluxe room rates start at $146 per night. Ask about California vacation packages. Montage Resort & Spa, located in Laguna Beach, offers vacation activities for all ages. Whether your family enjoys swimming, kayaking or hiking, the area offers something for everyone. For the younger guests, Montage has a children's club designed for children 5-12 years old where kids can engage in arts, crafts, games and activities such as cooking, hiking, and fishing in the kids pool. La Costa Resort and Spa features new splash Landing pools and waterslides, including three pools, three waterslides, a waterplay zone and the Splash Cafe. The height requirement for the two large waterslides is 48" and the height requirement for the smaller waterslide is 36." However, small children have their own sandy beach pool. Visit Carlsbad Beach, just five minutes from the resort. This is one of the top beaches in California, great for swimming and surfing. The resort offers a shuttle to the beach in the summer. Kids ages 6-12 can take their first surfing lesson at the Half-Day Surf Camp, offered seasonally by La Costa. Room rates at this Southern California family vacation resort start at $300 per night (plus tax and $21 daily resort charge). Ask about California family vacation packages. Plan a California family vacation to Safari West, a wildlife preserve in Napa Valley and watch 400 animal species such as zebras, giraffes and cheetahs. Safari West offers daily safari tours as well as private safaris on the 400-acre wildlife preserve. Sleep in one of the upscale safari tents imported from Africa. Tents start at $225 per night. 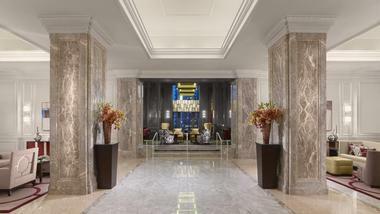 The Ritz-Carlton San Francisco is a first class hotel for families. Kids can play in the hotel's indoor pool and order from the children's menu at The Terrace Restaurant. Visit Fisherman's Wharf, ride in a cable car and take a family photo at the Golden Gate Park. The hotel provides family vacationers with the "Nanny Survival Kit" and the "POLO" Program which provides young guests with a night-light, tub spout cover and electrical outlet plugs. Rooms from around $459 per night, depending on the season. 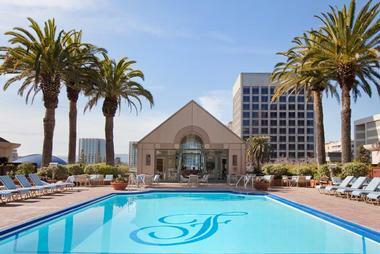 The Fairmont San Jose, located in Silicon Valley, features a rooftop pool, health club and elegant high-tech guest rooms designed for business. Guests can choose to dine at three restaurants and lounges with flavors ranging from American fare to Chinese cuisine. In the afternoon, indulge with Traditional Tea, an authentic experience complete with a choice of teas, elegant sandwiches, traditional English scones, fresh pastries and a glass of champagne. A visit to the spa is an ideal way to end a stressful day; enjoy a customized massage, facial or a body scrub on your vacation. After you're done with meetings, tour the nearby wineries, or play a round of golf on one of the Monterey Peninsula golf courses. The hotel can cater to weddings from small to large. Take advantage of the extensive facilities to plan your perfect event. There are 731 guest rooms and 77 suites with luxury furnishings, high speed internet access in the guest rooms, and wireless access in the lobby. Fairmont Rooms: Located on the lower floors, the Fairmont Rooms measure 450 square feet (42 square meters) in size and have one King, one Queen, or two Double beds. Located on higher floors, Deluxe rooms offer great views over the Santa Cruz Mountains or city skyline. Signature rooms have direct access to the outdoor swimming pool. The outdoor patio is fully furnished. If you like relaxing outside catching some sun rays, this is a good room to book. Open-concept Junior suites have a a modern marble bathroom with a separate walk-in shower and a bathtub. Designed for families and business travelers who need more space, One Bedroom 900-square-foot suites consist of a separate bedroom with a king bed and a parlor area. 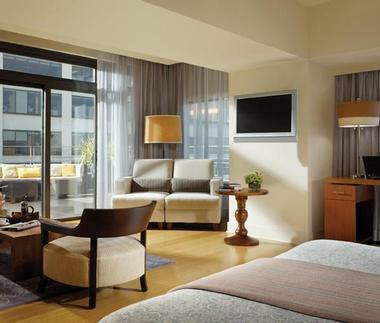 Located on higher floors of the hotel, Deluxe King suites enjoy a great view. With 1,896 square feet of space, the International Luxury suite is great for entertaining. It can accommodate a party of up to 50 people. Fairmont Luxury suites feature a decorative fireplace, baby grand piano, powder room and dining room table that seats eight. Presidential suites offer contemporary California decor, this suite is large enough for a small party or reception. The Signature suite has a spacious private patio with direct access to the outdoor swimming pool. Things to do in the area and family resorts in California: San Jose Attractions. If you are looking for quick weekend getaways from Los Angeles and San Diego, JW Marriott Santa Monica Le Merigot is located on Ocean Avenue in Santa Monica, California. The hotel features scenic Pacific Ocean views from many of its guest rooms and suites, easy access to the beach and upscale amenities. The 6,500-square-foot spa offers a menu of services, including massages, body treatments and signature services. The health club offers cardio exercise equipment. Take Yoga and Pilates classes to tone your muscles, swim in the outdoor pool, relax in the sauna and eucalyptus steam room. 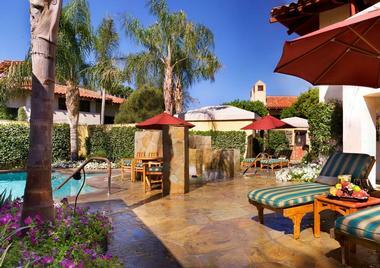 The heated outdoor pool is perfect for relaxing in the Southern California sun. The 160 guest rooms and 15 luxury suites feature Frette linens, plush robes and slippers. The Malibu and Catalina suites have a parlor and layouts that range from 475 square feet to 850 square feet in size. Deluxe and Executive rooms have private balconies and patios. If you are planning a romantic weekend getaway, consider staying on the Adult Only Floor. Measuring from 330 square feet (30sqm) to 370 square feet (33sqm), City View King Rooms accommodate up to 3 guests. A layout with two Double beds is also available, as well as a King Balcony Room. Measuring 430 sq ft to 470 sq ft in size, Premiere King Rooms have a living area. Hotel Vitale is a luxury waterfront hotel overlooking the bay. The property features modern interior design with soothing natural elements. The hotel has a spa, outdoor rooftop deep soaking tubs and a penthouse level yoga studio with a terrace. 199 guest rooms and suites feature luxury amenities, such as limestone covered bathrooms and 440-thread count sheets. Guests receive complimentary wifi or high-speed Internet access. All rooms and suites are non-smoking. For best views, book the Penthouse Landmark View Suite or one of the Panoramic Suites. The suites have a tub for two, ideal for a romantic getaway. The hotel's signature restaurant, Americano, serves dishes with an emphasis on fresh ingredients from the local Farmer's market across the street. The Cocktail Lounge offers 180 degree views of the water and Bay Bridge. The historic Ferry Building Marketplace with a selection of shops and restaurants is across the street. If you want to access other parts of the city, the historic trolley cars stop in front of the Ferry Building. Room rates start at around $309 per night, depending on when you go. 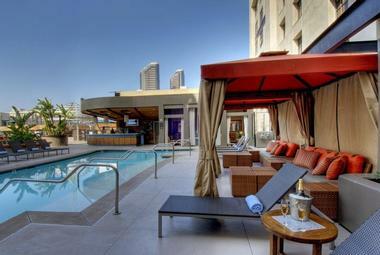 Kimpton Solamar Hotel is a hip luxury hotel in downtown San Diego. The hotel is located one block from PETCO Park and three blocks from the San Diego Convention Center. Guests can indulge in in-room spa treatments, bring their pets and attend a hosted evening wine hour on their weekend trip. The outdoor pool is surrounded by plush lounce chairs and cabanas that offer shade. The hotel has 235 rooms and suites decorated with rich fabrics, Frette linens and vibrant colors. The special pillow "menu," lets you choose from eight different cushions delivered to your room. In-room yoga, Pilates and core strengthening exercise programs are offered on the TV, letting you stay in shape while you travel. Jsix Restaurant serves California Coastal cuisine. LOUNGEsix is a popular hot spot for locals and visitors alike. While the hotel is pet-friendly, pet free floors are available to guests who prefer not to be near pets. Hotel rooms start from $185 per night. San Diego is an amazing city to visit, offering sandy beaches, parks, historic attractions, stylish hotels and restaurants. Here are some of the most popular things to see and do in the city. Visit the Cabrillo National Monument and enjoy a scenic view of the spot where Juan Rodríguez Cabrillo landed in 1642. The visitor center offers lectures about the explorer’s voyage. Follow the Bayside Trail for stunning views of the rugged coastline. From the cliffs, you can watch gray whales migrating from Baja California up towards Alaska. High-powered telescopes can be found at a viewing station. The best time to see gray whales is in January and February. The New Children's Museum offers hands-on exhibits for kids of different ages, as well as art workshops and an outdoor park with a playground. The museum was built using recycled materials and uses solar power. Plan a shopping trip to the Fashion Valley mall which offers over 200 shops and restaurants, featuring retailers such as Bloomingdale's, Neiman Marcus, Michael Kors and Jimmy Choo. Located right next to Yosemite National Park in California, the Evergreen Lodge is an outdoor adventure getaway that provides a great base for exploring the north-western corner of the park. If you are looking for family summer vacations, this historic property offers a selection of guided activities, a program for kids and relaxing massages at the end of your active day. Guided outdoor activities include fly fishing, biking, touring, hiking, rafting, snowshoeing, geocaching and more. The hotel provides rentals, such as mountain bikes, GPS units, snowhoes and trekking poles. If you want to go swimming or play tennis, visit the adjacent Camp Mather which offers a spring-fed lake with lifeguard on duty during the day, a swimming pool, tennis courts and acres of lawn for picnicking and sunbathing. The fee to enter the 350-acre family camp owned by the City of San Francisco is $10 per day for Adults and $5 per day for Kids 12 and under. Designed for children ages 5 to 12, the Kid's Program varies by season and costs from $40 per child, including lunch or dinner. 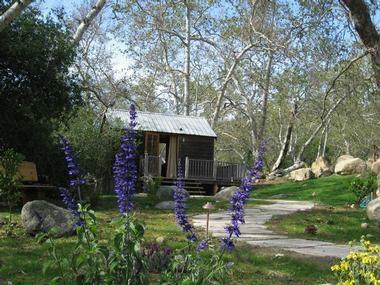 The property offers a selection of Yosemite cabins of different sizes, surrounded by 15 acres of tall pines. All cabins have private bathrooms, decks, heat and fans. There are, however, no phones and television to help you reconnect with nature. There are complimentary Internet terminals in the Recreation Building and a TV in the Main Lodge. The restaurant offers three meals daily. Guests can dine in the dining room, at the bar and in the outdoor beer garden. In the evenings, the hotel offers a diverse selection of programs, such as movies, slide shows, live music and guest lectures. 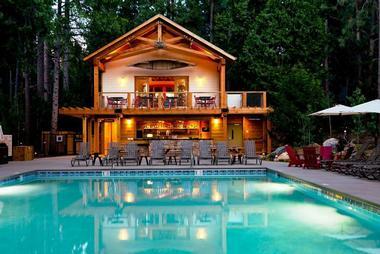 The lodge is a 3.5-hour drive from the San Francisco Bay Area and 6 hours from Los Angeles, California. One bedroom cabins range from $79 to $169 per night, depending on the season. Summer is peak season in Yosemite and winter is low season. One-Bedroom Cottages, which can accommodated two to four guests, range from $119 to $189 per night. Two-Bedroom Family Cabins cost from $149 to $229. A two-night minimum stay is required during peak season from mid-May 13th through the end of September, and during the holidays. More California vacation ideas: Top 10 Things to Do in San Francisco & Oakland with Kids and California vacation packages. There are many things to do in California year-round and some of the best vacation spots for kids are located in this beautiful state. More kid friendly vacations, weekend & day trips: 25 Best Weekend Getaways from Los Angeles and 45 Best Weekend Getaways from San Francisco. 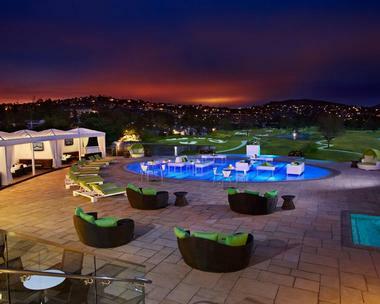 The Fairmont Miramar Hotel in Southern California has a year-round heated swimming pool. 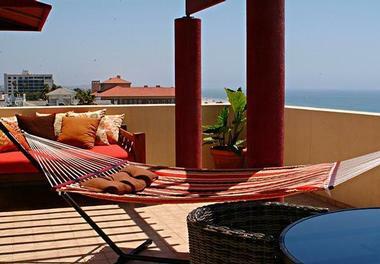 Guests of the hotel have easy access to the Santa Monica State Beach. Enjoy a picnic, visit the Santa Monica Pier, or go out for an afternoon of shopping. Choose from rooms and suites in two towers, or splurge on one of the 32 garden bungalows with private patios. Room rates start at $339 in the summer, bungalows from $459 per night. More California vacation ideas: 10 Perfect Lake Tahoe Weekend Escapes. 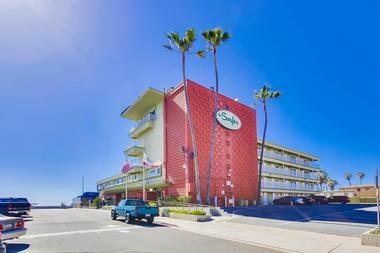 Comfort Inn & Suites Long Beach is a modern, colorful and bright hotel in downtown Long Beach, a perfect spot to drop your bags and start your adventure. Go visit all the nearby attractions: the Aquarium of the Pacific, Long Beach Convention & Entertainment Center, El Dorado Nature Center or Disney California Adventure Park. When you come back, you can enjoy your cozy, comfortable, spacious room with microwave, TV, refrigerator and free Wi-Fi. Some rooms also have whirlpool tubs, work space and living areas. Splash in the hotel heated pool, hit the gym or, if you must, do some work in the hotel’s well-equipped business center. 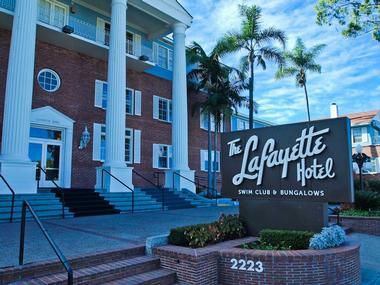 Built in Colonial style in 1946 and located in the San Diego’s North Park neighborhood, overlooking Mission Valley, the Lafayette Hotel was a notorious place where celebrities used to hide or party. After quite a colorful history and many different incarnations, Lafayette has been renovated and returned to its original glory with 131 rooms and private bungalows, all exceptionally comfortable, with all modern amenities. Bungalows are quirky vacation homes with many period details, spacious and equipped with everything you need for a memorable family vacation. The hotel’s famous 25 meters long Weissmuller Pool was designed in 1946 by Johnny Weissmuller, an Olympic swimmer who played Tarzan in the movies. The pool is such a popular Southern California attraction that it hosts many concerts and parties. Lafayette’s guest can treat themselves with excellent food at two restaurants: HOPE 46, which offers classic American cuisine, and The Red Fox Steakhouse. Where to vacation in California: Things to Do on Catalina Island, Things to Do in Santa Clarita and Things to Do in Del Mar. 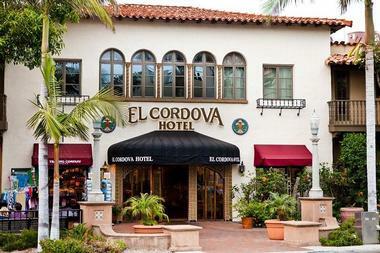 Bring the kids to El Cordova Hotel and let them feel a bit of California history. Built in 1902 as a home of the rich industrialist Elisha Babcock, El Cordova is a hacienda-style charming mansion on Coronado Island, with the courtyard filled with flowers and paved with colorful Mexican tiles. Each room and suite is unique and decorated in a luxurious but quirky and comfortable way. Many rooms have kitchens, living rooms, one or two bedrooms, private bathrooms, walk-in closets and all modern amenities such as free Wi-Fi and TVs. You can enjoy one of the hotel’s four restaurants, venture out and hit one of the best California beaches or stroll through the charming beach town of Coronado and explore its shops, restaurants and theatre. 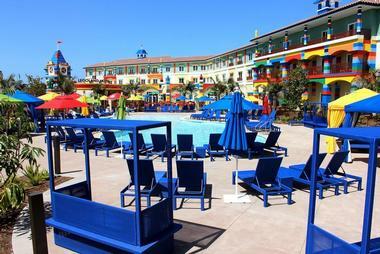 Legoland Hotel offers plenty of fun and is an ideal California vacation for kids. The hotel has 250 colorful guest rooms themed after three of the famous LEGO toy lines: Adventurer, Pirate and Kingdom. Guest rooms at Legoland Hotel are designed with a separate sleeping area for kids. There are Interactive LEGO features through the hotel, play areas, a heated swimming pool, themed elevators and a buffet restaurant that makes kids feel at home. The Skyline Bar serves fresh drinks and snacks with a view throughout the day. The atrium has a knight's castle where kids can play on a 32-foot high pirate shipwreck and a river of Lego. Legoland California Resort is a children's theme park located just half an hour north of San Diego. With over 60 rides, performance shows and attractions, the resort is a fun destination for families. The resort houses the first Legoland Water Park in the world, the Lego Legends Chima Water Park and the Sea Life Aquarium. The Minifigure Market allows guests to participate in its Build-A-Mini program of LEGO bricks. 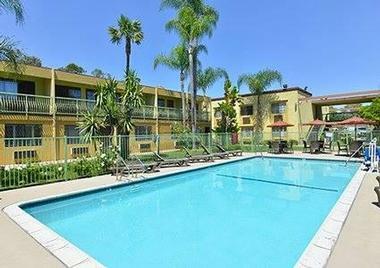 If you are looking for affordable California vacation spots, room rates start at $109 per night. Ask about California vacation packages. 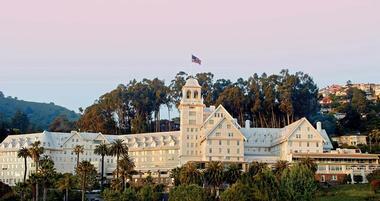 Hyatt Regency Monterey is a 550-room resort located on the Pebble Beach Company's Championship Del Monte Golf Course. The resort has a 12,000 square foot Accista Spa which utilizes locally-derived natural ingredients such as organic seaweed, sea salt and juniper. To stay in shape during your golf and spa vacation, work out at the hotel's 24-hour gym, swim in the pools, go biking and jogging. Standard rooms have large windows and décor that emphasizes soothing earth tone colors. Other room categories include Accessible rooms, View rooms, Regency Club, Suites and Villas. Regency Club King accommodations overlook Spyglass pools. The suites offer 685 square feet of living space, including a comfortable seating area with a large sofa and work desk. The President’s House is a 2,500 square foot villa with 4 bedrooms and a private swimming pool. If you are planning a special event, family reunion a girlfriend’s weekend getaway, or a business meeting, take a look at this luxurious villa. The plush house has everything you might need, from a Mac computer to a gas cooking range. Dining choices include TusCA Restaurant which serves Tuscan food, Knuckles Sports Bar and the Fireplace Lounge which features live Jazz music and great appetizers. Rooms start at $167 per night. 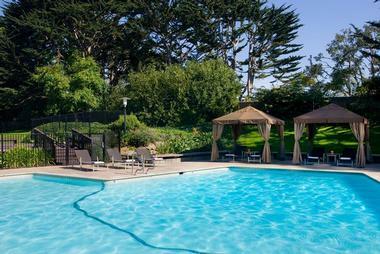 Nearby attractions include the Bay Aquarium, Carmel-by-the-Sea, Big Sur Coastline and many wineries. The hotel offers great family and romantic specials which incorporates attractions in the area. The Aquarium Package includes Monterey Bay Aquarium tickets, breakfast and late check-out, allowing you to relax longer. Located atop Nob Hill, the Fairmont San Francisco is situated near cable car lines that provide guests with quick access to Union Square, Fisherman's Wharf and the Financial District. The hotel features a grand lobby, Roof Garden, a relaxing spa and a grand public space with two restaurants and two lounges. 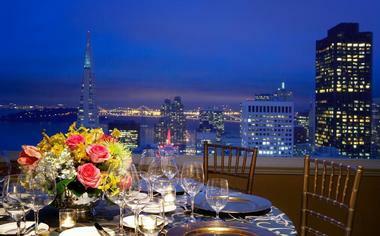 When making a reservation, be sure to ask for one of the rooms with a view of the city and the bay. This Penthouse Suite offers incredible views of San Francisco from its scenic location atop Nob Hill. The space features a beautiful outdoor terrace which overlooks the City and Bay. There are three large bedrooms, four bathrooms, a living area with a fireplace, stereo system and plasma screen television, formal dining space, spectacular library, billiard area and an outside terrace. You can entertain up to 100 people in this extraordinary suite, whether you are planning a large party or a more intimate celebration. The accommodation measures 6,000 square feet (557 square meters) in size. There is One King bed (master), One King bed (guestroom) and One Queen bed (children's). Guests can choose from several dining venues, including the Tonga Restaurant and the Hurricane Bar which serve Pacific Rim Asian Cuisine in a tropical rainforest setting. The signature restaurant, Laurel Court, serves fine cuisine with an emphasis on fresh regional ingredients (415-772-5260 for reservations). The Terrace Level houses Club One at Nob Hill which offers work-out equipment and fitness classes. There is an admission fee for non-Fairmont President's Club guests. Active Sports Clubs at Nob Hill Spa offers a range of spa services such as sports massage, Swedish massage, deep tissue/connective tissue massage and acupressure. Packages start from $259 USD per night. If the beach is your main reason for coming to San Diego, then Surfer Beach Hotel is your home away from home. Located on one of the most beautiful city beaches, Surfer Beach Hotel is a perfect combination of clean comfort, quirky mid-century décor and great location. Spacious rooms and suites range in size and amenities, but all have very comfortable beds, private bathrooms, free Wi-Fi and TVs. 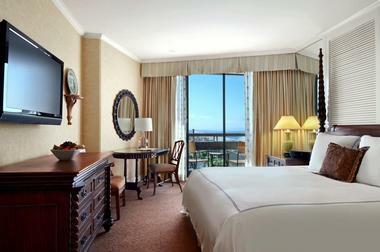 Many rooms have direct access to the hotel pool, and the rooms on higher floors enjoy spectacular ocean views. Larger rooms and suites have kitchens and dining rooms, perfect for a family vacation. Just outside of the hotel there are many great restaurants and bars, and a short drive away are all the city attractions such as San Diego Zoo, SeaWorld, Gaslamp Quarter, the Historic Old Town and Balboa Park. What to do this weekend - trips to California: Sonoma & Napa Vacations.